On September 25, Jews celebrate the New Year (Rosh Hashanah), which traditionally is the time for resuming results. On the feast, believers respond to the Lord for the last year and repent in bad deeds. President of the Federation of Jewish Communities of Russia Alexander Boroda shares his thoughts about changes in life of Jews in Russia, conditions of their living in Ukraine, sanctions, and Crimea's joining Russia in his interview with Interfax-Religion. - Rabbi Alexander, what has changed in Russia's Jewish community for the recent year? - The year was stable, there was some extensive development, new synagogues were opened: in some places building of synagogues, schools, Mikvas was accomplished. What is more important, there was more intensive development, more lessons, more people, more events. We see qualitative improvement. - In June, the Moscow Arbitrary Court decided that the USA Library of Congress has to return seven books from Lubavitcher rabbi Joseph Isaac Schneerson's library to Russia, the books were conveyed to the country in 1994 and given to temporary usage to the Agudas Chassidei Chabad. The USA is not hurrying to fulfill the demand. How can you comment on it? Does FJCR have an possibility to influence the USA Jewish community? - We don't have such a possibility. Absolutely, we can't influence it. But it seems to me there are some legal documents that set up the provisions according to which the Library of Congress took the books. Corresponding documents were signed to define the USA responsibility for these books for the term of keeping them. I don't have enough information to evaluate the question. If there is interchange among libraries, giving to temporal use, then it certainly supposes the return of the books. May be, there was a mistake in the documents, as we use to think that the USA has the rule of law. If all documents were signed, and books were conveyed in temporary use, then it is desirable to observe all agreements. It is a question of interstate relations, which are built up independently of religious community. - How Jews of Ukraine survived the events the country had faced? Did they feel the splash of nationalism? - Certainly, the Jewish community of Ukraine is under influence of the events developing in the south-east of the country. First of all, Ukraine has become poorer, communal payments have grown, the prices have increased, unemployment boosts. Ukraine is in a difficult economic situation. It influences all residents, including the Jewish community. Firstly. Secondly, when there are economic tensions and chaos, it certainly influences national minorities. I can't say there is systematical anti-semitism in Ukraine, but total chaos multiplies problems as there is no order. If we speak about events in south-east, there are certainly many refugees, who left places of military actions for other Ukrainian cities and towns, where Jewish communities gave them shelter, provided them conditions for living. There is absolute chaos in Lugansk and Donetsk communities. 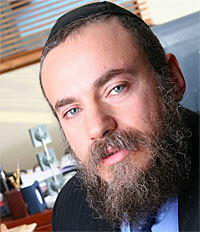 The rabbi left Lugansk, may be he has already returned, but he left for the time of military actions. There is a rabbi in Donetsk, but Jewish life is in poor condition. It is difficult for people to visit synagogues during military actions. Only one third of the population stayed in Donetsk, others left the city. - It is simply dangerous to visit synagogues, some members of Lugansk and Donetsk communities were killed, it is objective reality. - I know nothing about it. - Crimea joining Russia - is it coming back or annexation? - If we look how Russia and western countries see it, then views will be right opposite. If we speak from Russia's point of view, then Russia observed maximum formal procedures, Crimea held a referendum on independence, and then chose the way of joining Russia. There is no unique position on the question, as our world consists of various, to put it softly, ambiguous things. The strongest one is always right. Unfortunately. So if we analyze actions of different countries on protecting their interests, they won't correspond to any moral norms or "vegetarian" approaches. In this sense, the main criteria is people's life standards. I don't want to give any evaluations in political aspect, we are not a political organization. As to Jewish life, we hope, it won't suffer. - And what do local Crimean Jews say? Are there any changes in their life? - The Jewish life hasn't deteriorated. There is no immigration. There is a kind of stability and prospects for expanding Jewish life in Crimea. Local community actively builds plans on building what hadn't been built when the territory was a part of Ukraine. Jewish life hasn't suffered, there is a chance to do what hasn't been done. I will stress one more time, we are not a political organization, I can't give political evaluations, I speak as a private person, a leader of religious organization. - What is your opinion about sanctions of the West against Russia? Have response sanctions influenced market of the Kosher products? - It is surprising, but it can improve the situation. In connection with western sanctions, and what is more important, in connection with Russia's counter sanctions, Russia has need to import meat, milk, vegetables from Israel, these products are being imported, contracts with Israel are actively signed on the goods, which were not imported from Israel before, first of all, it is agricultural production. We are optimistic about increasing business activities between Israel and Russia. - Do you share concerns of the so-called creative class that introduced sanctions make it impossible to buy camembert and jamon in Russia, so it is better not to introduce them? - I think that the question of state integrity, question of territorial integrity, generally, the question of global foreign policy of the state lay far above food tastes of people. I understand that counter sanctions have brought certain problems to the store counters, we see it, it is true. Things grew more expensive, we also see it, but it is not because the state wanted to create a problem for population. Here is another task.These are very important actions in the field of foreign policy, that should finally lead to restoration of relations with the European Union and the USA. On this stage, the state considered it right to introduce response sanctions, so that the West feels certain discomfort from the sanctions they introduced. Certainly, there is always discomfort in such situations, it is economic war, war for markets, and if we overlook the events in south-east Ukraine, it gives grounds for some countries to get certain economic preferences in the world from weakening their competitor - Russia. - Representatives of the same layers of society often say they are ashamed for their country in connection with recent events. Do you share their shame? - No, I'm certainly not ashamed for my country. I can say that President Putin enjoys great support of population, including Jewish population. I can't say that majority of population is keen on politics, however, some basic foundations of foreign policy were voiced and people, including Jewish community, support them. A motion of "shame" supposes some deeper knowledge of the subject, or self-reproach without any visible grounds. I believe that Russia has always had its own understanding of home and foreign policy - a thousand years ago, five hundred years ago, three hundred years ago. Russia stands on its positions, its own understanding of its role in the world, understanding of priorities. Can we say that Russian way is the same as European? No, we can't. It is individual. But it has the right to exist. Generations of people achieved it through sufferings. - Speaking about reaction of certain part of society on Russia's sanctions, they mention biblical exodus, when Jews preferred freedom and poverty to eating Egyptian meat. Do you see any parallels with the period? - I don't see such parallels. We have always had a chance to develop our industries. - From the Bible we know about seven years of plenty and seven hungry years and Chubais told about it, he said we lived the years of plenty, then there would be hungry years. There were approximately seven years before crisis (2001-2008), and them seven years of crisis, from 2007 till 2015. The grandeur of the state is to see years of plenty and to stock up everything necessary. So I can't say it released us. I can't say that sanctions added the feeling of freedom. We have always had freedom to develop our internal industries. Sanctions are always evil, they added discomfort. Sanctions are extreme measures, and we pray they will be resumed as soon as possible. Any interstate cooperation is beneficial for everyone. It is such a situation that foreign policy pushed the West to take sanctions against us, and made us to take response sanctions. Though the West says that sanctions influence Russia's actions, we know examples of countries, which live for thirty years under sanctions and they didn't change their way, for instance Iran. Sanctions are tougher there, and what has happened to Iran for this time?! It keeps living and hasn't changed its views. It is not the best way to press on the country, talented diplomacy is much more effective than sanctions. I don't have any special proudness from the fact that we live under sanctions, as well as from the fact that we introduced sanctions.